I'm confused about choosing the right assault to invest tokens in and i seek advice for especially endgame uses. First i gave a pink star to AoD. Because Sonja had defensive stance which had uses but eventually i would use Rufus or Abraham as a meat shield. Then, ruthless came and i decided that RiB is the best. But sometimes he does too much charged damage and instantly kills walkers to be used to charge assaults again. AoD seems well balanced but double ruthless from armor and survivor (RiB) is very tempting. Also i'll never seem to get heroes pink stars, so having a pink starred meat shield (Sonja) could be useful for endgame. Note: I use two assaults frequently and if i use a hero it is Sasha, Rufus or Abraham respectively. Sorry for the length of the message, but i couldn't explain my confusion in shorter sentences. Well aren't you spoilt for choice! I think many would regard AoD as the perfect assault, when it comes to difficult challenge missions you really need iron skin and it means that you don't have to waste too many badge slots for damage reduction. You are right in that ruthless and crit damage isn't really desired for the assault class, it is best reserved for shooter/scout. If I was to pick between the two I would go for AoD for 2* pink and upwards and keep RiB as back up. Sonja, I would scrap for tokens. Personally my 2* pink assault has marksman, luck, iron skin, revenge and vigilant so I'm a little jealous of your luck! I have grown to love revenge/vigilant and I don't miss sure shot or dodge too much. It’s a toss up between AoD and Sonja for me. Rib is paper thin unless you have 3 great dmg reduction badge and iron skin armor. As far as best traits it depends on what your goals are and how far you go in the challenge. 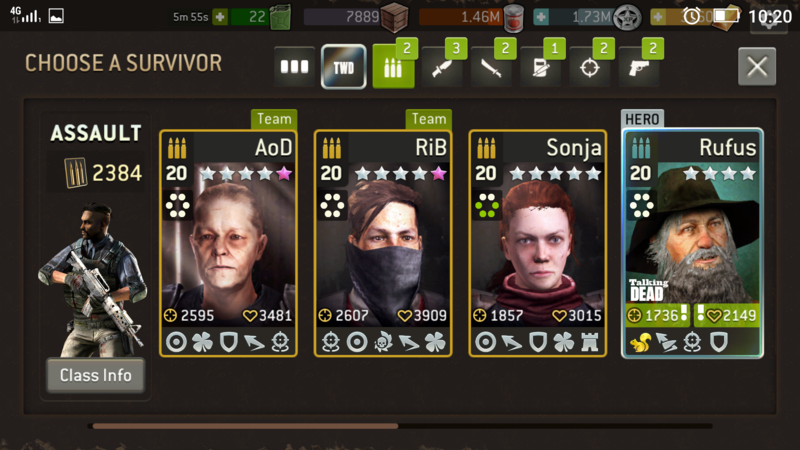 Currently i can go to challenge level 26-27 with level 20+1 (1 for pink star) survivors. And going further is the main goal for me. Actually it is the main point of starting this discussion. I don't use Assaults in Overwatch so Def Stance on Sonja is a worthless trait to me. AoD is the unicorn and RiB is the exact combination I'm looking for right now. Depending on how far upgraded you have Abe and if you use him would determine my strategy. If you take out both AoD and RiB on high RSL missions together then I'd look to keep their token upgrades fairly close so one doesn't get too far ahead of the other. Focus on AoD, secondary focus on RiB. I have an Assault with Lucky, Dodge, Sure Shot, Ruthless and Revenge. He has some health and damage reduction badges to help out with no Iron Skin plus some damage badges. Overall as a secondary Assault he does very well. Thanks to everyone for valuable different points of wiev. @Cronus , i'm very unlucky with Abraham, he is only rare. My team is usually Sasha, AoD and RiB. Sometimes a shooter replaces one of this trio, and sometimes i use rufus. Abraham and Sasha calls gave me 64 tokens or none per call in exchange for the 500 phones burnt. İ'm having the idea that my ideal assault could have ruthles-dodge-ironskin-marksman. Fifth trait could be sure shot or lucky. But with the ones i already have, waiting for that one will be greedy and illogical. If you got lucky-dodge-marksman-iron skin-ruthless that would be one badazz combination. That is one that's on my list for sure. Based on what you said regarding taking both those survivors out together I'd advance AoD ahead of RiB until RiB is losing too much effectiveness relative to AoD. Then spend tokens on RiB. Your Assault team is truly killer. I'd say Sasha with those two Assaults and getting them charged up quicker is more valuable than Abe and RiB with one of your survivor Hunters. When it comes to maps where the walkers start out right in front of you, I love the Marksman/Sure Shot combination. AoD and RiB are perfect for those maps. But Sure Shot loses some effectiveness because I tend to move my Assaults on every turn to maximize the cone of death. AoD is my favorite and that's where I would invest the tokens. She has the best overall traits that are good with most situations. But using Aod and RiB together is a killer combo. Sonja might make a great Outpost defender if you want to stick her there. Even with badges not working for defenders, she can soak up a lot of damage if you can also put here behind cover with some Sniper Harness armor. So, I wouldn't retire her right away. Congrats on having some great Assaults for any occasion! So, common idea suggests that my old school assault should be preferred one step ahead. Also i'm against scrapping even mediocre assaults after the distance mode has emerged. In the long run i aim to equip AoD with better damage and damage reduction badges, maybe critical damage too. Thanks again. Sorry for resurrecting the topic but what if you had three good damage reduction and three good damage badges of the same set ? Would AoD still be the first choice? My primary Assault has the exact traits as AoD does. I maxed her out with damage badges and gave her two damage reduction badges. The last badge was added to get the bonus. If you have good damage and damage reduction badges you'll like AoD even more (is that old man or old woman btw?). Ruthless is a great trait but I like it better for Hunters/Shooters/Scouts/Warriors. An old woman i think, i wasn't sure but @Governator called "she" too. Original name was leslie, now angel of death . Thanks again @Cronus . Ha ha, leslie, that doesn't help at all. Should change name to Pat (wrt SNL).